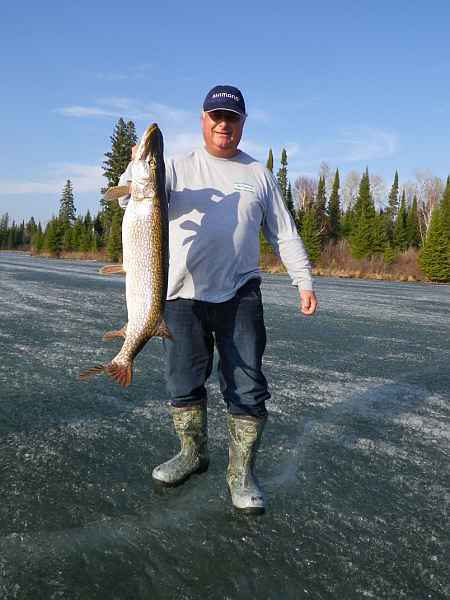 Ice Fishing, a remote fishing adventure awaits you. Our efforts target the large Northern Pike that cruise the mouths of bays looking for an easy meal. Our packages include all accommodations, tackle, bait, holes augured, and fully guided transportation to and from the designated spots along the Winnipeg River. Lunch is also included and cooked for the group right on the water. Our track machine with custom trailer and skis can transport groups of up to eight persons comfortably to the fishing spots. Three night /two-day excursions, $450.00 per person. Two night / One full day and on half-day excursions, $375.00 per person. These packages will be available for trips into George or Forbes lake for Lake Trout, or for fishing the Winnipeg River for monster pike. The day trip costs are $450.00 per two persons. Each additional person is $100.00 per day extra. Included in the packages are all transportation to and from the fishing spots, portable ice shacks, bait, tackle, and snacks while out on the ice.